The RB3011 is a new multi port device, our first to be running an ARM architecture CPU for higher performance than ever before. The RB3011 has ten Gigabit ports divided in two switch groups, an SFP cage and for the first time a SuperSpeed full size USB 3.0 port, for adding storage or an external 3G/4G modem. 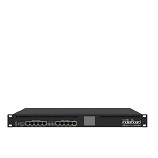 RB3011UiAS-RM Unit comes with 1U rackmount enclosure, a touchscreen LCD panel, a serial console port and PoE output functionality on the last Ethernet port.